Initiated the search for the burial location of Geo. Sullivan Doty and the many husbands of Delilah nee Fair, supplying their dau. Nancy nee Doty Jones family pic, obit, insight. Overview/best guess: George Sullivan Doty's first wife died abt. 1850+. Geo. remarried Delilah nee Fair 1853+/- in IL or IN and came to Westfield (Fayette) village area, Fayette.Co.IA, in 1854. Delilah had been married before to a Clouse, Williams and possibly a Merritt. Geo. died shortly after arriving in the Westfield area and was the third burial in Grandview Cemetery at Fayette.IA, probably in the late fall of 1854. Delilah was pregnant with Nancy Fair Doty who was born in Dec 1854 in the Westfield/Fayette village area. They had children by other marriages and possible adoptions with them. Jane Doty was taken in by the Harrison Augir family SW of Fayette. Allen Doty needs to be accounted for from abt 1855-1875. Other children need identified and account for after Geo. 's death, when Delilah either went back to IL/IN or moved toward the Jones families in Buchanan.Co.IA, south of Fairbank. Delilah remarried by 1860 to Daniel Hipsher (Hipshire/Hepshire/Hepshear), and lived the rest of her life in Buchanan, Fremont and possibly Black Hawk counties. In the 1885 census Daniel and Delilah are living in Jesup village, Buchanan.Co.IA, thus Jesup and Buchanan.Co.IA is the place to start looking for death and burial, followed by Waterloo/Cedar.Falls in Black.Hawk.Co.IA. Page Changes (some may not show on page as are made in the master FTM file). ...2012Feb18, Contact email for Richard Beem. Brief overview/best guess. Various analogs for names. Added Nancy Fair nee Doty Clouse obit and settled on Nancy's birth location either in or near Westfield village plat area (west side of what would become Fayette) Westfield.Twp, Fayette.Co.IA, before she joined the Jones family between what would be Fairbank and Jesup, and near the Chatum P.O. in Afton.Twp (near today's Littleton, Fairbank/Perry.Twp), Buchanan.Co.IA. Standardized Nancy's father's name as George Sullivan Doty and mother as Delilah nee Fair Clouse Williams up to the time of marriage to Geo. Doty, or until time a better understanding develops of a possible very short marriage Delilah may have had with an Unknown Merritt between Williams and Doty. Standardize Hipsher as the most common spelling for Daniel, last husband of Delilah nee Fair, with Hepshear, Hepshire as options taken from Iowa Census listings. Minor changes in FTM data made but not significant enough to reload. Started Jan 2012 as the result of contact regarding the death of George Sullivan Doty and the McKee line in Fayette.Co.IA. Constant confusion so started over 2012Feb10. Worked on: Feb 13, 2012. Fair surname tree and maps follow the notes. ...1829about, David T. Williams 1799/OHorKY-1850/Jasper.Co.IN, marries inTN, Lucy Sims 1700/VA-1847/Montgomery.Co.IN. They will have four known children, before she dies and David remarries Delilah nee Fair Clouse in Aug 1849. ...1838before, Delilah nee Fair apparently married Unknown Clouse in KY or IN. He would die 1848-1849/IN. The had two known children MarthaA 1838/IN, Wm1848/IN. Possible Clouse analogs: Clouss, Clause, Claus, Clauss, Closs, Cluss. ...1838, Martha A. Clouse is born in Indiana to Unknown Clouse x Delilah nee Fair Clouse (1813/KY-aft1885/IA). ...1847Apr18...Allen Doty is born to Geo. Sullivan Doty and wife (speculate a Sarah or another Unknown and NOT Delilah nee Fair Clouse/Williams/Hepshire, bz/2012). ...1847, David T. Williams' first wife died in Indiana (Lucy Simms 1799/VA-1847/IN, married abt 1829). Their children were George 1834/IN-abt1905/IN, Nancy Catherine 1837/IN-1917/IN, Maranda Jane 1839/IN-1925/IN, and James bef1840/IN. ...1849Aug23, David T. Williams married widow Delilah nee Fair Clouse in Montgomery.Co.IN. Delilah had two of her own children (Martha b.1838/IN & Wm b.abt1848/IN). David is a plasterer/mason, but would have also farmed. ...1849/1850 winter, David T. Williams died in a winter snowstorm. Delilah was pregnant with son Samuel David T. Williams (b.Feb1849/IN). ...1850Sep20Census: Beaver.Twp. Jasper.Co.IN. Delilia (nee Fair, Clouse) Williams37/KY Her two children MarthaA Clouse 12/IN, William Clouse 2/IN. Her new baby Samuel D. (David) T. Williams 0/IN and step/dau Miranda Jane. Williams 12/IN, the youngest daughter of David T. Williams (his first wife was Lucy Simms 1799/VA-1847/IN. ...1850about, Wife of Geo. 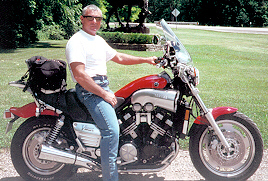 Sullivan Doty, mother of Allen Doty dies (in Illinois) Obit: shortly after his wife dies Geo. Sullivan brings the family to the Fayette (Westfield village) area of Fayette.Co.IA. Allen's Twin sister Jane in the 1856 Census is living with Chancy/Chancey Hulbert/Hubbert 1832/NY mason, in sec 9, Westfield.Twp, fay.Co.IA. Jane is listed b.1847/IL and has been Iowa 1y, which if correct means that Geo. 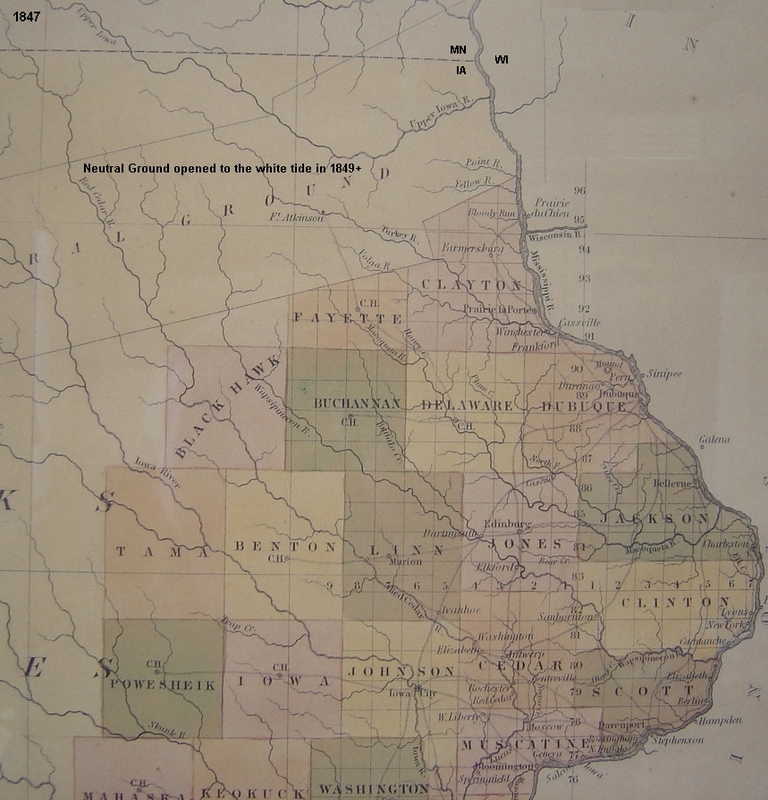 Sullivan brought the family to the Westfield village after the 1854 census in mid/late 1854 to mid/late summer 1855, and according to speculation died within a short time of arrival in Iowa. 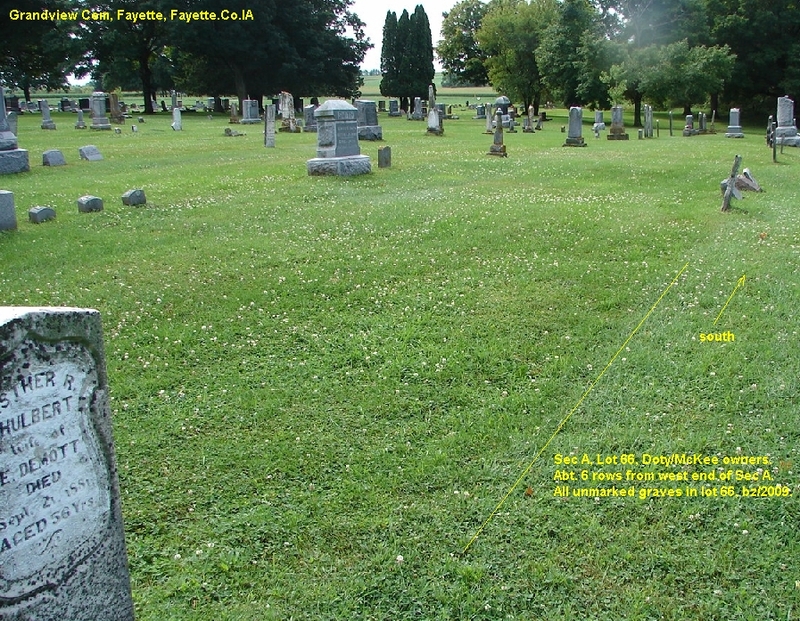 There is an unmarked burial listed as Doty, David Mr., Grandview Cem, sec A, lot 66, unmarked, burial #3, Fayette, Fay.Co.IA. My speculation is that this burial is Geo. Sullivan Doty who died late fall to early winter of 1854, and assuming the children were taken in by local pioneer families. I am also speculating that Geo. Sullivan had remarried Delilah nee Fair Clouse in IL before coming to Fay.Co.IA, and that she was pregnant with dau Nancy Fair Doty, who was born Dec 19, 1854, probably at Westfield.village or possibly she went immediately to Indiana/Illinois families/friends in the Fairbank area of Buchanan.Co.IA on the SW border of Fay.Co.IA. It should be noted the early 1850's are the very first years of white settlement in Fay.Co.IA and some of the early years in Buchanan.Co.IA, bz.2012. ...1851-1852, Delilah nee Fair Clouse Williams, may have remarried an Unknown Merriett/Merritt shortly after her second husb. David Williams died. Thee is a Samuel W. Merriett/Merritt yet to be accounted for, bz/2012. In the 1910 census, Wadena.MN, Samuel Merriett 58/IL, is listed single and bro/law living with Melville and Nancy Fair Doty (dau of Delilah) Jones. If bro/law of Melville, Samuel is a half bro. of Nancy nee Doty. Or Samuel Merriett may have been taken in (adopted) by Geo. Sullivan Doty and Delilah nee Fair Clouse Williams when they married. ...1850Census, Buchanan.Co.IA, No Jones, Doty, Hepshire/Hepshire surnames listed. ...1852Census, Buchanan.Co.IA, John Jones, wf & 2ch, Spring.Twp (Newton.Twp, in SE corner), Buchanan.Co.IA. ...1853-1854, Delilah nee Fair Clouse-Williams remarried widower George Sullivan Doty abt1813/NY-1854/Fayette.IA. Geo's first wife died 1850-1851, leaving him with birth children and likely other orphan children. ...Daniel Hepshear apparently moved to to Alton (Fairbank/Perry).Twp, Buchanan.Co.IA, between the 1856 & 1860 census. He was not located in any 1850 census. He is not in the 1856 Iowa Census, but has arrived and married Delilha nee Fair Clouse-Williams-Doty by the 1860 Buchanan.Co.IA census. Delilah's dau. Nancy Doty b. Dec 1854 is listed born in Iowa in census data, however is is possible she went directly back to IL after the death of husb. Geo. Sullivan Doty in Fayette.IA, remarried in IL or IN and then returned to Buchanan.Co.IA, with her new husband Daniel Hepshear/Hepshire, before the 1860 Iowa Census. 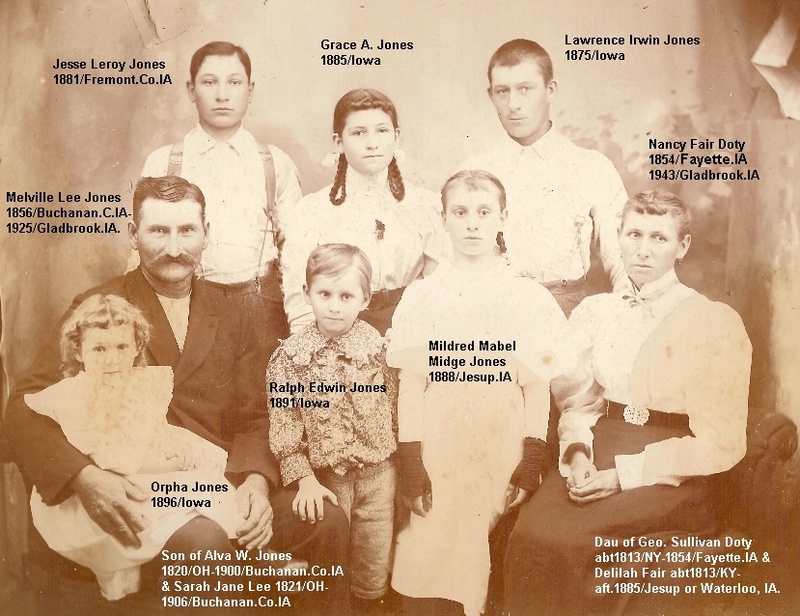 The Jones family is already in Buchanan.Co.IA by 1856 and more likely about 1854/1855, at a time when Delilah could have joined them from Fayette.IA, after her husband Geo. Sullivan Doty died in late 1854 at Fayette.IA, bz/2012. ...Delilah nee Fair Clouse-Williams-Merritt(? )-Doty remarried Daniel Hepshire/Hepshear either in the Buchanan/Black.Hawk.Co.IA area or in IL/IN before the 1860 census. They are found in Iowa for the 1860, 1870, 1880, 1885 censuses. Delilah's son Samuel David T Williams is with her. 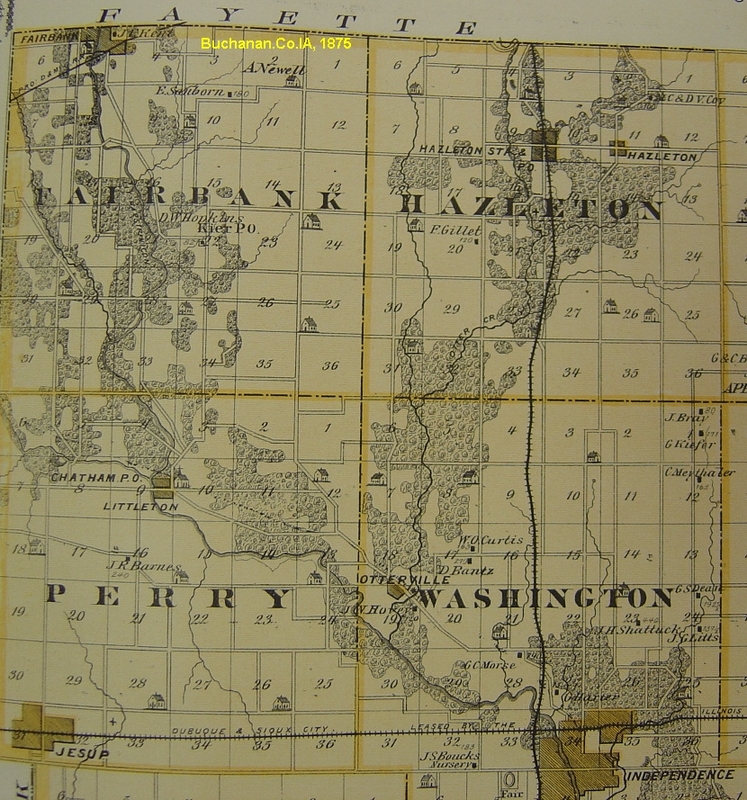 Note: Almost all Hepshire's mentioned in early paper search are in Logansport.Cass.Co.IN, Waterloo.Bk.Hawk.Co.IA, Tipton.Tipton.Co.IN, Ft.Wayne.Allen.Co.IN, in that order, i.e. no other locations in the country until after 1930. Cass.Co.IN, is the major location. The Hepshear spelling only produced 3 paper hits, the Hepshire spelling 41 hits. The most common spelling across the US is Hipsher. ...1856Census, Buchanan.Co.IA, farming in Alton.Twp, Alva/Alvy Jones 35, SarahJan32, John14, Oreldeet6, Cordelia10, Theodore2. This is the area south of Fairbank, around today's Littleton village, and will become Fairbank/Perry.Twp. 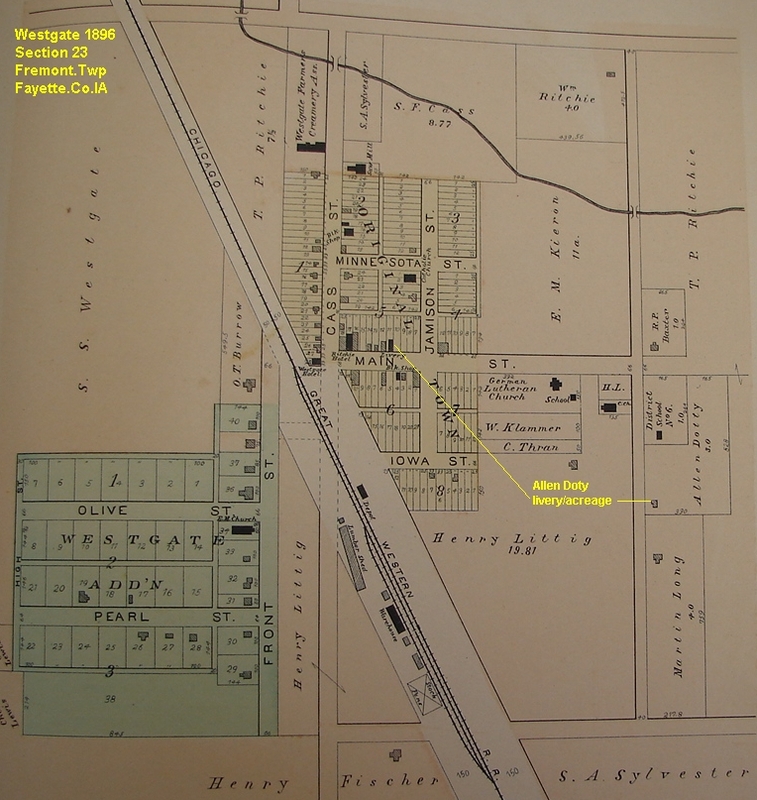 The northern portion of Fairbank village is in Oran.Twp of the SW corner of Fayette.Co.IA. ...1856Census, Delilah nee Fair Clouse Williams Doty was not found in Fayette or Buchanan Co, IA. The pages were not totally browsed. Delilah may have gone back to IL or IN and remarried before returning with husb. Daniel Hepshear. Her dau. Nancy Fair Doty would have been born either near Westfield village or in the Littleton area of Buchanan.Co.IA with or near the Jones family, shortly after the death of her husb. Geo.Sullivan Doty in the Westfield village area. ...1856Census, Buchanan.Co.IA, the western side of Buchanan.Co , the area from Fairbank village south through the Jesup village area was browsed for 'signs' of the Hepshire/Hepshear family but they were not found, there it is assumed that Daniel Hepshear/Hepshire came to the western side of Buchanan.C.IA, between late 1856-1860, and married Delilah (nee Fair) Clouse/Williams/Doty, likely in western Buchanan.Co.IA. 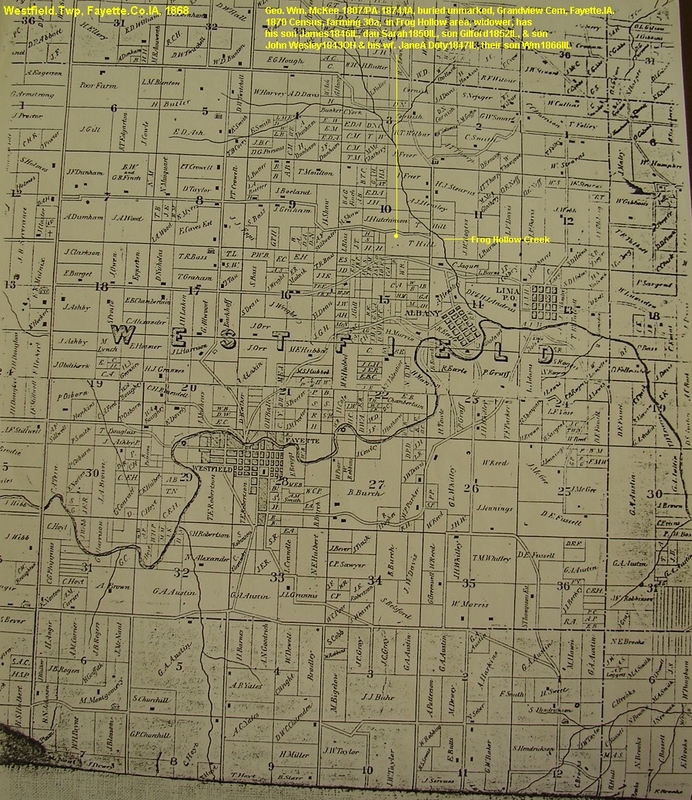 ...Note: in the mid to late 1850's, the Alva Jones and the Daniel Hepshear/Hepshire families were farming along the Little Wapsie River flowage, in the today's Littleton village area, about 6mi south of today's Faribank and 6mi north of Jesup, in Buchanan.Co.IA, bz/2012. Delilah (nee Fair) 47/KY, has remarried Daniel Hepshear. Daniel's children with his first wife: Henry Hepshear 16IL, William Hepshear 13IN. ...1866Oct12WaterlooIApaper, Schedule of bills allowed by Bk.Hawk.Co. board of supervisors, Sep 1866 session, Wm. Hephsire, witness before inquest, claimed 1 10 allowed. ...1870Census: Barclay.Twp, Black.Hawk.Co.IA, Daniel 'Heptsher' Hepshire/Hepshear 59, Delilah57, farming; living with them is Delilah's son Samuel Williams, 19/IN, farm hand. Barclay.Twp is just west of the Littleton area of Fayette.Co.IA. ...1870Census: Cedar Falls P.O., Barclay.Twp, Black.Hawk.Co.IA (Barclay.Twp. is just west of Fairbank & Perry, Twp's of Buchanan.Co.IA), Charles Kleckner 1835/PA farmer (big) $5k/1200, Ann1846/Hanover.Germany, George 1862/IA; William Hepshery 1849/IL farm hand (this is William Hepshear, son of Daniel1811 & his first wife; 2nd wife was Delilah nee Fair, mother of Nancy Doty), Nancy Doty 1855/IL (likely IA) domestic servant. ...1870Census: Alton(Fairbank)Twp, Buchanan.co.IA, Alvy Jones49, Sarah46, Theodore15, Melville13, MaryE8. ...1880JunCensus: Monroe.Twp (NE corner), Fremont.Co.IA, farming Daniel Hepshery 69/PA (b.abt1811) parents b. PA; Delia 66/KY (with dyspepsia) parents b. TN, s/son Samuel D. Williams 29/IN, farming, father b. PA, mother KY. Fremont.Co.IA is in the far SW corner of the state. ...1880JunCensus: Riverside (Riverton? ).Twp, Fremont.Co.IA, Melville Jones, wf Nancy Fair nee Doty, son Lawrence. ....1885Census: S. Ainsworth.St, Jesup, Perry.Twp, Buchanan.Co.IA. s/son Samuel Williams, 36IN, a laborer. George A. Doty 26IL, laborer. ...1900Census: In Scott.Twp, Fremont.Co.IA, Christian Hipsher45IN 1855/Cass.Co.IN, parents b.Indiana; IdaMay nee Atkinson32KS 1868 married 1869, DaisyMay15IA 1885-1969, HermanEverett13IA 1887, WarrenLeslie11IA 1889-1971, LucyPearl8IA 1892-1982; later Ora Gertrude 1902, Clara Marie 1906. Fremont.Co.IA, is were Daniel and Delilah Hipshire/Hipsher were in the 1880 census. ...1900Census: Benton.Twp, Fremont.Co.IA, Samuel L. Hipsher35IN, MinnieJ34OH, ErvaM13IN, Irena9IN. ...1900Census; New Hartford, Beaver.Twp, Butler.Co.IA, farming, Samuel Williams58IN, Malvina49IA (8ch, 5 living), Frankie20IA, CharlesN14IA, Marion12IA. ...1910Census; Beaver.Twp, Butler.Co.IA, farming, Samuel Williams62IN, Malvina59IA, Forest H. Fifield 4IA g/son. ...Is Samuel W. Merritt/Merriett a son of Delilah nee Fair and another marriage falling between marriages to David T. Williams and Geo. Sullivan Doty? If so she married a Merriett abt. 1850-1852, and then Geo. Sullivan Doty abt. 1853-1854. Samuel W. Merriett may have been adopted or possibly Samuel David T. Williams. Where is Samuel David t. Williams? He may have stayed in IN or IL and not made the move to Iowa with Delilah and Geo. Sullivan Doty. ...1910Census; 4th St, Wadena, Wadena.Co.MN, Samuel W. Merritt 1852/IL, single, odd jobs, parents b.KY, listed bro/law, living with Mellvill L. Jones 1858/IA odd jobs, father b. MI, mother IN; wife Nancy 1855/IA, parents b. KY; Irwin 1876/IA; Mildred 1888/IA, Ralph 1891/IA ; Bell Lutrull 1891/MN telephone exchange operator. Close by is: Clare/Clare Procter/Proctor 1835/MA widowed; her son Claude Proctor1878/IA, his wife Grace nee Jones Proctor 1876/IA, their son Paul Proctor 1908/MN, their dau Naoma Procter 1909/MN. Grace is the dau. of Melville and Nancy nee Doty Jones. ...1880Census; Jackson.Twp, Montgomery.Co.IA, Samuel W. Merritt 1853/IN, parents b. PA: LenoraA 1858/IA, father b. PA, mother OH; AlbertN 1879/IA ; close is PeterM Merritt 1824PA widower. This Samuel W. Merriett is listed on Ancestry as possible son of Deliliah nee Fair but does not fit if b. PA, plus living close to Peter Merritt would indicate Peter as a possible father. Samuel Merriett does not fit a husb of a known sister to Melville Jones, either. ...1930Census; W. 11th St, Waterloo, Bk.Hawk.Co.IA, lodging with JessN Gaskins56, is Samuel Williams 82IN widowed. Assuming this is Samuel Williams son of Daniel Williams and Delilah nee Fair Clouse Williams? Nancy Fair nee Doty Jones, only child of George Sullivan Doty and Delilah nee Fair Clouse Williams. Jesse Leroy and Ralph Edwin are likely adopted. 1904Nov10Waterloo, Melville Jones, left Tues for Texas in hopes of receiving benefit for rheumatism. ... 5 FAIR, Absalom b: 05 Feb 1776 in NC d: 25 Feb 1862 in Greene.Co.IL Note 5: 1830 Census: Absalom Lais (Absalom/Abraham Fair), Greene.Co.IL, wf & 2males, 1female. Note 6: 10 Oct 1833 Land; 80a, sec 31, T12N, R10W, Greene.Co.IL. Note 7: 1840 Census; 1male, 2females, Abraham Faire (Absalom/Absalem Fair/Faire) Mt.Airy, Greene.Co.IL Note 8: 1850 Census; bet. Macoupin & Apple Creeks, Greene.Co.IL. Note 9: 1850 Absalom Fair1776NC, Sarah1790KY, James1823KY, Thomas Wood 1840IL. Note 11: 1860 Census; Absolam Fare 83/NC, with wid dau & 7ch, Athensville P.O., Mt.Airy.Precinct, Greene.Co.IL. .... 6 FAIR, Louisa b: 18 Feb 1816 in Liberty, Casey.Co.KY d: 20 Apr 1906 in Greenfield, Green.Co.IL Note 9: 1860 Census; farming, wid, 7ch & father, Athensville P.O., Mt.Airy.Precinct, Greene.Co.IL. ... 5 FAIR, Aaron B. Absalom Absolam Fare Far Fears b: 19 Jan 1792 in Burke.Co.NC or KY d: 10 Mar 1867 in Greenfield, Greene.Co.IL Note 11: 1850 Census; A.B.Fair1792NC, farming Casey.Co.KY, adj is Peter Lyon1825KY. Note 12: 1850 A.B.1792NC, Leah1793KY, Absolam1813KY, John1831KY, Thomas1834KY, Rebecca1837KY. .... 6  FAIR, Delilah Deliah Fears b: Bet. 1813 - 1814 in Casey.Co.KY d: Aft. 1885 in Jesup, Buchanan.Co.IA or Bk.Hawk.Co.IA Note 4: Given analogs; Delilah, Deley, Delia. Note 6: Bef. 1838 Married Unknown Clouse in IN or KY, two known ch. MarthaA1838IN, Wm1848IN. Note 7: Bet. 1848 - 1849 Clouse husband dies; in Aug 1849, she remarries widower David T. Williams in IN. Note 8: Bet. Dec 1849 - Feb 1850 David dies in a winter snow storm, leaving Delilah pregant, with her 2ch & his Miranda1838. Note 9: Sep 1850 Census; Beaver.Twp, Jasper.Co.IN, Delilia (nee Fair, Clouse) Williams, 37/KY, baby Samuel David T. Williams 0/IN. Note 10: Sep 1850 Delilia also has her 2 ch MarthaA Clouse12/IN, Wm Clouse2/IN, s/dau Miranda Jane Williams12/IN. Note 11: Bet. 1851 - 1852 Delilah may have remarried an Unknown Merritt, birthing son Samuel W. Merritt1852/IL. Note 12: Bet. 1853 - 1854 Delilah married widower Geo. Sullivan Doty, moving to Westfield area, Fay.Co.IA. Note 13: Dec 1854 Sullivan Doty died, Delilah gave birth to their dau Nancy Fair Doty, likely in Westfield, Fay.Co.IA. Note 14: Bet. 1855 - 1860 ?Where is Delilah? She will remarry Daniel Hepshire by 1860. Note 15: 1860 Census; farming, N of Chatham (Littleton) P.O., Alton (Fairbank).Twp, Buchanan.Co.IA. Note 16: 1860 Daniel Hepshear40PA, ch with 1st wf, Henry Hepshear16IL, Wm Hepshear13IN Note 17: 1860 Delilah46KY, son Samual David T. (Williams)10IN Hepshear; dau Nancy (Doty)5IA Hepshear. Note 19: 1870 Census; farming, Barclay.Twp, Bk.Hawk.Co.IA (just west of Fay.Co.IA). Note 20: 1870 Daniel Heptsher59, Delilah57, her son Samuel Williams19IN. Note 22: 1880 Census; farming, Monroe.Twp (NE corner), Fremont.Co, SW corner of IA. Note 23: 1880 Daniel Hepshery69PA, Delia66KY, her son Samuel d. Williams29/IN. Note 24: 1880 Farming close is dau Nancy Fair nee Doty Jones, husb Melville & son Lawrence. Note 26: 1885 Census; S. Ainsworth St, Jesup, Perry.Twp, Buchanan.Co.IA. Note 27: 1885 Daniel Hepshire79PA blind, Delila71KY, her son Sam Williams 36IN laborer, Geo. A. Doty 26IL laborer. ........ +WILLIAMS, David T. b: 1799 in OH or KY d: Feb 1850 in Jasper.Co.IN m: 23 Aug 1849 in Montgomery.Co.IN Note 8: 1840 Census; plasterer/mason, Wayne.Twp, Montgomery.Co.IN, wf. 2 sons, 2 dau's. Note 9: 1847 First wf. Lucy Simms dies in Montgomery.Co.IN. Note 10: Aug 1849 Remarries Delilah nee Fair Clouse; has 2ch with her, Martha1838, Wm1848. Note 11: Bet. Dec 1849 - Feb 1850 David dies in a winter snow storm, leaving Delilah pregnant, with her 2ch & his Miranda1838. ..... 7 MERRITT, Samuel W. Murett Merriett b: 1852 in IL Note 7: 1910 Census; laborer, 58/IL, listed single & b/law, with Melville Jones, Wadena, Wadena.Co.MN. Note 8: 1910 Parents listed b. KY, which fits Delilah Fair but not Sullivan Doty. Note 9: 1910 If b/law, then likely half sister of Nancy Fair nee Doty Jones. Note 10: 1910 Which means Samuel W. Merriett's mother, Delilah nee Fair married a Merriett after Clauss, bef. Doty, bz/2011. Note 11: 1910 Or, Sam.Merriett was 'adopted' by Geo.Sullivan & Delilah nee Fair Doty. ........ +DOTY, George Sullivan Slyvanus b: Abt. 1813 in NY d: Abt. Jun 1854 in Assumed Westfield village (Fayette) area, Fay.Co.IA, bz/2012 Burial: Bet. May - Dec 1854 Suspect listed as Doty, David Mr., Grandview Cem, sec A, lot 66, unmarked, burial #3, Fayette, Fay.Co.IA, bz/2012Jan20. m: Bet. 1853 - 1854 in IL or IN Father: Elijah (suspect) DOTY Note 1: 11 Feb 2012 Doty last reviewed; Barry.Zbornik Hannibal.MO iowaz@hotmail.com Note 4: Surnames closely connected; Doty, Jones, McKee. Note 5: This Doty family not found together in 1850, 1852, 1856 Fay.Co.IA Census, bz/2011. Note 6: May have operated a poor house/farm in IL, possiblly adopting children. Note 7: Bet. 1850 - 1851 Obit for son Allen b. Apr1847, states mother died when 3, father brought family to Fayette, shortly after. Note 8: Bet. 1853 - 1854 Speculate Sullivan remarried Delilah nee Fair Clouse Williams before trip to Fayette.IA, bz/2012. Note 9: Abt. 1854 Allen'sObit: father brought family to farm near Fayette (Westfield) shortly after Allen's mother died. Note 12: 1854 ?Twins Allen & Jane came to Fayette.IA with Sullivan & Delilah. Where were his/her other children? Note 13: Bef. Dec 1854 Sullivan dies Fayette area, Deliliah is pregnant with Nancy. Note 18: Aft. 1855 Delilah apparently did not 'keep' any of Sullivan's ch. by his first wf, they were taken in by Fayette area families. Note 22: Aft. 1855 Dau Jane raised by Harrison Augir1817/NY, 3mi SW of Fayette.IA. Note 23: Bet. 1855 - 1875 ?Where is Allen after death of father Sullivan in Fayette? Note 25: Aft. 1856 After death, wf. Delilah remarried Daniel Hepshear/Hepshire & lived in Buchanan, Fremont, Bk.Hawk Co's, IA. ..... 7 DOTY, Nancy Fair b: 19 Dec 1854 in Littleton.area, Buchanan.Co.IA or Westfield village, Fay.Co.IA d: 1943 in Gladbrook, Tama.Co.IA Burial: Badger Hill Cem, Gladbrook, Tama.Co.IA. Note 11: 1900 Census; b.Dec1850/IA, husb & 6ch, Oelwein, Fay.Co.IA. Note 12: 1900 Melville44, Nancy44, LawrenceI24, Jesse18, Grace14, Mildred12, Ralph9, Orpha4. Note 14: 1910 Census; 55/IA, husb Melville & 6ch/6living, parents b. KY, 4th St, Wadena, Wadena.Co.MN. Note 15: 1910 Living with is, Samuel W. Merrett 58/IL, parents b. KY, (listed b/law of husb, thus bro of Nancy). Note 20: 1920 Census; 55/IA (age?? ), father b. OH (?? ), mother KY, Gladbrook, Tama.Co.IA. Note 21: 1920 MelvilleS 54IA, NancyF55IA, RalphE28IA. Note 23: 1925 MelvilleL67, NancyF70IA, RalphE33, ElmerN7, RoseE8. Note 24: 1925 Census; 70/IA, with husb, adopted son Ralph & his two ch, 3rd St, Gladbrook, Tama.Co.IA. Note 25: 1925 Father listed Selvanus Doty b.?, mother Deliliah Clauss b.KY, married IL. Note 27: 1930 Census; wid, adopted son Ralph with, Gladbrook, Tama.Co.IA. ......... +JONES, Melville Melvin Lee b: May 1856 in Fairbank area, Alton(Fairbank) Twp, Buchanan.Co.IA d: 1926 in Gladbrook, Tama.Co.IA Burial: Badger Hill Cem, Gladbrook, Tama.Co.IA. 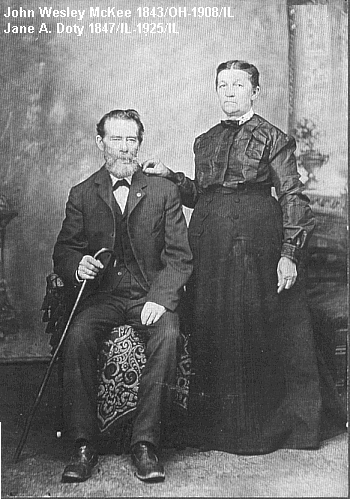 m: 02 Jul 1875 in Prairie du Chien, Crawford.Co.WI Father: Alva W. JONES Mother: Sarah Jane LEE Note 6: 1860 Census; with parents, farming near Fairbank, Fairbank.Twp, Buchanan.Co.IA. Note 7: 1860 Alvy49, SarahJ46, Theodore16, Melville13, MaryE8. Note 8: 1870 Census; with parents, farming near Fairbank, Fairbank.Twp, Buchanan.Co.IA. Note 9: 1875 Marries Nancy Fair Doty. Note 10: 1880 Census; farming Riverside.Twp, Fremont.Co.IA (far SW corner), wf Nancy & son Lawrence, parents near. Note 11: 1895 Census; Bk.Hawk.Co.IA Note 12: 1900 Census; RR boiler maker, wf & ch, Oelwein, Fay.Co.IA Note 13: 1900 Melville44, Nancy44, LawrenceI24, Jesse18, Grace14, Mildred12, Ralph9, Orpha4. Note 14: 1910 Census; laborer, odd jobs, wf & ch, 4th St, Wadena, Wadena.Co.MN Note 15: 1910 MelvilleL52IA, Nancy55IA, Irwin34, Mildred22, Ralph19, Orpha14, SamuelWMureet38, Bell Luttrull14. Note 16: 1910 Samuel W Murett/Merritt with, 38IL, listed b/law, parents b. KY. Note 22: 1920 Census; city utility laborer, wf & step/son, 3rd St, Gladbrook, Spring.Creek.Twp, Tama.Co.IA. Note 23: 1920 MelvilleL54, NancyF55, RalphE28IA laborer. Note 24: 1925 Census; Gladbrook, Tama.Co.IA, Melville67, NancyF70, adopted son RalphE33 div. with ch. ElmerN7, RoseE8. ....... 8 JONES, Jesse Leroy (adopted?) b: 30 Jun 1881 in Riverside.Twp, Fremont.Co.IA or Allamakee.Co.IA d: in In the south, USA. Note 6: Possibily adopted. Note 8: 1900 Census; painters apprentice, with parents, Oelwein, FayCo.IA. Note 11: 1918 Draft Card; famring, married, ch, Decorah, Winneshiek.Co.IA. ........... +PROCTOR, Claude Uriah b: 08 Jun 1878 in Iowa Father: Uriah A. PROCTOR Mother: Clara T. UNKNOWN Note 11: 1910 Census; with wid mother, wf Garce Jones & 3ch, Wadena, Wadena.Co.MN. Note 12: 1910 In/laws Melville & Nancy Jones nearby. ....... 8 JONES, Ralph Edwin (adopted?) b: 26 Mar 1891 in Iowa Note 6: 1920 Census; listed adopted, div, laborer, 3rd St, Gladbrook, Tama.Co.IA. Note 8: 1925 Census; with parents, 3rd St, Gladbook, Tama.Co.IA; div, ch. ElmerN7, RoseE8. ........ 9 HEVENER, Frank D.
.... 6 FAIR, Serena b: 06 Nov 1819 in Casey.Co.KY d: Aft. 1880 in Cass.Co.MO? .... 6 FAIR, Thomas J. b: 16 Feb 1834 in Casey.Co.KY d: 27 Mar 1913 in Cass.Co.MO Note 9: 1860 Census: Macoupin.Co.IL, AaronB Far68, Leah67; son Thomas26 wfBarbara23, dauEliz3m. 1 JONES, John b: Aft. 1790 d: in OH, 1830? Note 1: 01 Jan 2012 Jones last reviewed; Barry Zbornik Hannibal MO iowaz@hotmail.com Note 6: Lived in PA? .. +WELLS, Anna Caroline b: 04 Apr 1798 in Cumberland, Allegany.Co.MD d: 23 Apr 1887 in Fairbank area, Buchanan.Co.IA Burial: Suspect umarked, Luth.Ch.Cem, Philander Brant plot, Fairbank.IA, D.Beem/2012. m: 19 Sep 1819 Note 9: Outlived 3 husbands. Note 11: Went to the Fairbank.IA area with son Alva. 2 JONES, Daniel G. b: 1818 in OH d: in Taylor.Co.IA Note 8: 1850 Census; farming near Alva Jones in Porter.Co.IN. 2 JONES, Alva W. b: Bet. 1820 - 1821 in OH d: 1900 in Fairbank area, Buchanan.Co.IA Burial: Fairbank Cem, Fairbank.Twp, Burchanan.Co.IA Note 7: 1850 Census; farming, Porter, Porter.Co.IN, Alva29, Sarah267, John8, Cordelia5, Orcedeitt1. Note 8: Bet. 1854 - 1855 Indiana to Alton.Twp, Buchanan.Co.Ia. 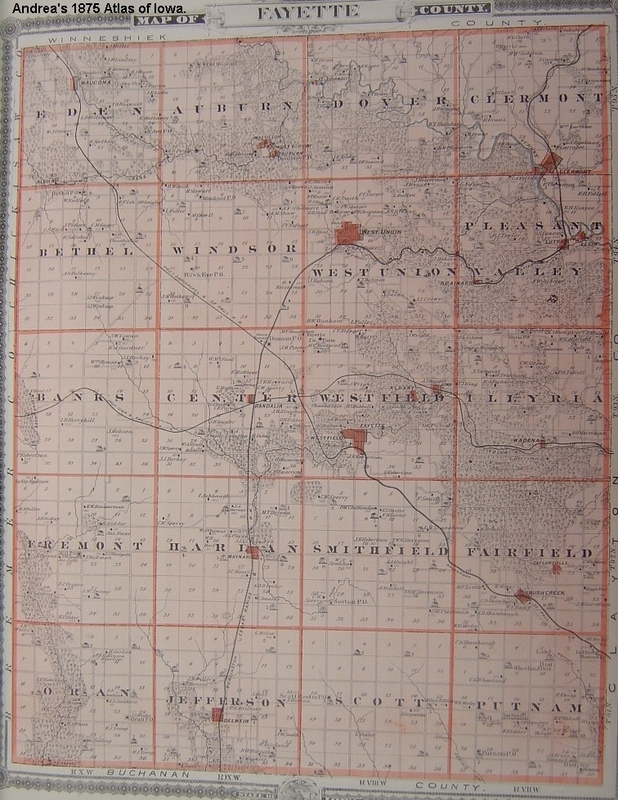 Note 9: 1856 Census; farming, Alton.Twp, Burchana.Co.IA. Note 10: 1856 Alvy35, SarahJane32, John14, Oreldeet6, Cordelia10,Theodore2. Note 13: 1860 Census; farming Fairbank area, Alton(became Fairbank) Twp, Buchanan.Co.IA. Note 17: 1870 Alvy49, SarahJ46, Theodore16, Melville13, MaryE8. Note 18: 1870 Cenus; farming, $2200/820, Fairbank P.O., Fairbank.Twp, Buchanan.Co.IA. Note 24: 1885 Census; laborer, Fairbank village, Buchanan.Co.IA, Alva64, SarahJ62, MaryE22. .... +SANBORN, Parker Edwin b: 02 Oct 1846 in Holderness, Grafton.Co.NH m: 1868 in Iowa? 3 JONES, Melville Melvin Lee b: May 1856 in Fairbank area, Alton(Fairbank) Twp, Buchanan.Co.IA d: 1926 in Gladbrook, Tama.Co.IA Burial: Badger Hill Cem, Gladbrook, Tama.Co.IA. Note 6: 1860 Census; with parents, farming near Fairbank, Fairbank.Twp, Buchanan.Co.IA. Note 7: 1860 Alvy49, SarahJ46, Theodore16, Melville13, MaryE8. Note 8: 1870 Census; with parents, farming near Fairbank, Fairbank.Twp, Buchanan.Co.IA. Note 9: 1875 Marries Nancy Fair Doty. Note 10: 1880 Census; farming Riverside.Twp, Fremont.Co.IA (far SW corner), wf Nancy & son Lawrence, parents near. Note 11: 1895 Census; Bk.Hawk.Co.IA Note 12: 1900 Census; RR boiler maker, wf & ch, Oelwein, Fay.Co.IA Note 13: 1900 Melville44, Nancy44, LawrenceI24, Jesse18, Grace14, Mildred12, Ralph9, Orpha4. Note 14: 1910 Census; laborer, odd jobs, wf & ch, 4th St, Wadena, Wadena.Co.MN Note 15: 1910 MelvilleL52IA, Nancy55IA, Irwin34, Mildred22, Ralph19, Orpha14, SamuelWMureet38, Bell Luttrull14. Note 16: 1910 Samuel W Murett/Merritt with, 38IL, listed b/law, parents b. KY. Note 22: 1920 Census; city utility laborer, wf & step/son, 3rd St, Gladbrook, Spring.Creek.Twp, Tama.Co.IA. Note 23: 1920 MelvilleL54, NancyF55, RalphE28IA laborer. Note 24: 1925 Census; Gladbrook, Tama.Co.IA, Melville67, NancyF70, adopted son RalphE33 div. with ch. ElmerN7, RoseE8. .... +DOTY, Nancy Fair b: 19 Dec 1854 in Littleton.area, Buchanan.Co.IA or Westfield village, Fay.Co.IA d: 1943 in Gladbrook, Tama.Co.IA Burial: Badger Hill Cem, Gladbrook, Tama.Co.IA. m: 02 Jul 1875 in Prairie du Chien, Crawford.Co.WI Father: George Sullivan Slyvanus DOTY Mother: Delilah Deliah Fears FAIR Note 11: 1900 Census; b.Dec1850/IA, husb & 6ch, Oelwein, Fay.Co.IA. Note 12: 1900 Melville44, Nancy44, LawrenceI24, Jesse18, Grace14, Mildred12, Ralph9, Orpha4. Note 14: 1910 Census; 55/IA, husb Melville & 6ch/6living, parents b. KY, 4th St, Wadena, Wadena.Co.MN. Note 15: 1910 Living with is, Samuel W. Merrett 58/IL, parents b. KY, (listed b/law of husb, thus bro of Nancy). Note 20: 1920 Census; 55/IA (age?? ), father b. OH (?? ), mother KY, Gladbrook, Tama.Co.IA. Note 21: 1920 MelvilleS 54IA, NancyF55IA, RalphE28IA. Note 23: 1925 MelvilleL67, NancyF70IA, RalphE33, ElmerN7, RoseE8. Note 24: 1925 Census; 70/IA, with husb, adopted son Ralph & his two ch, 3rd St, Gladbrook, Tama.Co.IA. Note 25: 1925 Father listed Selvanus Doty b.?, mother Deliliah Clauss b.KY, married IL. Note 27: 1930 Census; wid, adopted son Ralph with, Gladbrook, Tama.Co.IA.
. 4 JONES, Jesse Leroy (adopted?) b: 30 Jun 1881 in Riverside.Twp, Fremont.Co.IA or Allamakee.Co.IA d: in In the south, USA. Note 6: Possibily adopted. Note 8: 1900 Census; painters apprentice, with parents, Oelwein, FayCo.IA. Note 11: 1918 Draft Card; famring, married, ch, Decorah, Winneshiek.Co.IA. ..... +PROCTOR, Claude Uriah b: 08 Jun 1878 in Iowa Father: Uriah A. PROCTOR Mother: Clara T. UNKNOWN Note 11: 1910 Census; with wid mother, wf Garce Jones & 3ch, Wadena, Wadena.Co.MN. Note 12: 1910 In/laws Melville & Nancy Jones nearby.
. 4 JONES, Ralph Edwin (adopted?) b: 26 Mar 1891 in Iowa Note 6: 1920 Census; listed adopted, div, laborer, 3rd St, Gladbrook, Tama.Co.IA. Note 8: 1925 Census; with parents, 3rd St, Gladbook, Tama.Co.IA; div, ch. ElmerN7, RoseE8. ... 5 HEVENER, Frank D.
Obit: Nancy Jones, 89, Who fractured her hip died Tuesday. Last rites will be held at the Park Hill Church (Gradbrook, Tama.Co.IA), Rev. Williams officiating. Mrs. Nancy Fair Jones, who was in her 90th year, and known to most everyone in Gradbrook, as "Grandma Joines" passed away at 9am, Tuesday at the Evangelical Deaconess hospital, where she had been a patient since Oct. 25, after sustaining a broken hip at the home of her daughter, Mrs. Roy Follansbee in LaGrand.IA. Prior to her last illness she suffered some fractured ribs at her daughter's home where she has been staying. Nancy was born in Fayette county, Dec. 19, 1854, a daughter of George and Fair Clause Doty. She was married to Melville L. Jones in 1874 at Prairie du Chien, Wisconsin. Before moving to Gladbrook 35yrs ago, the family home had been in Fairbank.IA, and Wadena.MN. Mrs. Jones is survived by three daughters, Mrs. Grace Proctor, of Beveraly.Hills.CA; Mrs. Orpha Hevener, Belle.Plaine.IA, and Mrs. Roy Follansbee, LeGrand.IA. Five grandchildren also survive. Mr. Jones preceded her in 1926. Three sons, Jesse Leroy, Irvan Lawrence and Ralph Edward Jones, four brothers and three sisters have also preceded her in death. She was a member of the Babtist Ch. at Fairbank.IA. To her the struggle and burden bearing of earth are ended, and we confidently trust that like one who awakes from a troubled dream she wasawakened to see life's endless morning break and knows herself at home with all the vast throng of loved ones, missing here in this fevered world of disappointment. Funeral services will be held Friday afternoon, today, at the Park Hill Church of God in Gladbrook in charge of the minister, Rev. J.W. Williams. Burial will be in the Badger Hill cemetery northwest of Gladbrook. The body will remain at the Estel funeral home until taken to Gladbrook which will be open to friends at 12:30pm Friday. ... +JONES, Daniel G. b: 1818 in OH d: in Taylor.Co.IA Father: John JONES Mother: Anna Caroline WELLS Note 8: 1850 Census; farming near Alva Jones in Porter.Co.IN. ... +JONES, Alva W. b: Bet. 1820 - 1821 in OH d: 1900 in Fairbank area, Buchanan.Co.IA Burial: Fairbank Cem, Fairbank.Twp, Burchanan.Co.IA m: Bet. 1840 - 1841 in Porter.Co.IN Father: John JONES Mother: Anna Caroline WELLS Note 7: 1850 Census; farming, Porter, Porter.Co.IN, Alva29, Sarah267, John8, Cordelia5, Orcedeitt1. Note 8: Bet. 1854 - 1855 Indiana to Alton.Twp, Buchanan.Co.Ia. Note 9: 1856 Census; farming, Alton.Twp, Burchana.Co.IA. Note 10: 1856 Alvy35, SarahJane32, John14, Oreldeet6, Cordelia10,Theodore2. Note 13: 1860 Census; farming Fairbank area, Alton(became Fairbank) Twp, Buchanan.Co.IA. Note 17: 1870 Alvy49, SarahJ46, Theodore16, Melville13, MaryE8. Note 18: 1870 Cenus; farming, $2200/820, Fairbank P.O., Fairbank.Twp, Buchanan.Co.IA. Note 24: 1885 Census; laborer, Fairbank village, Buchanan.Co.IA, Alva64, SarahJ62, MaryE22. Jane Doty McKee, dau. of George Sullivan Doty & 1st wife. 1 DOTY, Elijah (suspect) b: Aft. 1790 in NJ Note 3: Possible parent of George Sullivan Doty, bz/2011. 2 DOTY, William S. b: Abt. 1818 in IN? 2  DOTY, George Sullivan Slyvanus b: Abt. 1813 in NY d: Abt. Jun 1854 in Assumed Westfield village (Fayette) area, Fay.Co.IA, bz/2012 Burial: Bet. May - Dec 1854 Suspect listed as Doty, David Mr., Grandview Cem, sec A, lot 66, unmarked, burial #3, Fayette, Fay.Co.IA, bz/2012Jan20. Note 1: 11 Feb 2012 Doty last reviewed; Barry.Zbornik Hannibal.MO iowaz@hotmail.com Note 4: Surnames closely connected; Doty, Jones, McKee. Note 5: This Doty family not found together in 1850, 1852, 1856 Fay.Co.IA Census, bz/2011. Note 6: May have operated a poor house/farm in IL, possiblly adopting children. Note 7: Bet. 1850 - 1851 Obit for son Allen b. Apr1847, states mother died when 3, father brought family to Fayette, shortly after. Note 8: Bet. 1853 - 1854 Speculate Sullivan remarried Delilah nee Fair Clouse Williams before trip to Fayette.IA, bz/2012. Note 9: Abt. 1854 Allen'sObit: father brought family to farm near Fayette (Westfield) shortly after Allen's mother died. Note 12: 1854 ?Twins Allen & Jane came to Fayette.IA with Sullivan & Delilah. Where were his/her other children? Note 13: Bef. Dec 1854 Sullivan dies Fayette area, Deliliah is pregnant with Nancy. Note 18: Aft. 1855 Delilah apparently did not 'keep' any of Sullivan's ch. by his first wf, they were taken in by Fayette area families. Note 22: Aft. 1855 Dau Jane raised by Harrison Augir1817/NY, 3mi SW of Fayette.IA. Note 23: Bet. 1855 - 1875 ?Where is Allen after death of father Sullivan in Fayette? Note 25: Aft. 1856 After death, wf. Delilah remarried Daniel Hepshear/Hepshire & lived in Buchanan, Fremont, Bk.Hawk Co's, IA. 3 DOTY, George (likely) b: in Allen's Obit lists as a brother. Note 9: Listed on Allen's Obit as a bro, bz/2012). 3  DOTY, Lewis Louis b: 1834 in Vermillion.Co or Ganeer, Kankakee.Co.IL d: 07 Jul 1892 in New Albany, Fall.River.Twp, Wilson.Co.KS Note 8: Civil War vet. Note 11: 1870 Census; farm hand, $0/500, Middleport.Twp, Iroquois.Co.IL Note 12: 1870 Lewis34NY, Phoebe35IN, JamesM13IN, John9IN, Christine4IL, SarahJ2IL. .... +MCKEE, Nancy Jane b: Abt. 1836 in Butler.Co.OH d: Nov 1859 in Kankakee.Co.IL m: 06 Sep 1857 in Kankakee.Co.IL Father: George William McKay MCKEE Mother: Ann Mariah CARTER Note 8: Died during birth of son George1859.
. 4 MCKEE, George Alvin Doty b: Nov 1859 in Momence?, Kankakee.Co.IL d: in Iowa Note 6: Natural mother; Nancy Jane nee McKee Doty, d.1859 during childbirth. Note 7: Aft. 1859 Mother died at child birth, raised by g/f Geo.Wm.McKee, took McKee name, bz/2012. Note 8: 1860 Census; with Geo McKee family, Momence P.O. Ganeer, Kankakee.Co.IA Note 9: 1860 GeoMcKee52PA, AnnM43VA, John17OH, James15OH, SarahM11IL, WmG8IL; GeoADoley (Doty)1. Note 11: 1870 Census; b.1859IL, listed with Geo McKee, sec 10, Westfield.Twp, Frog Hollow area, 1+mi NW of Albany, Fay.Co.IA. 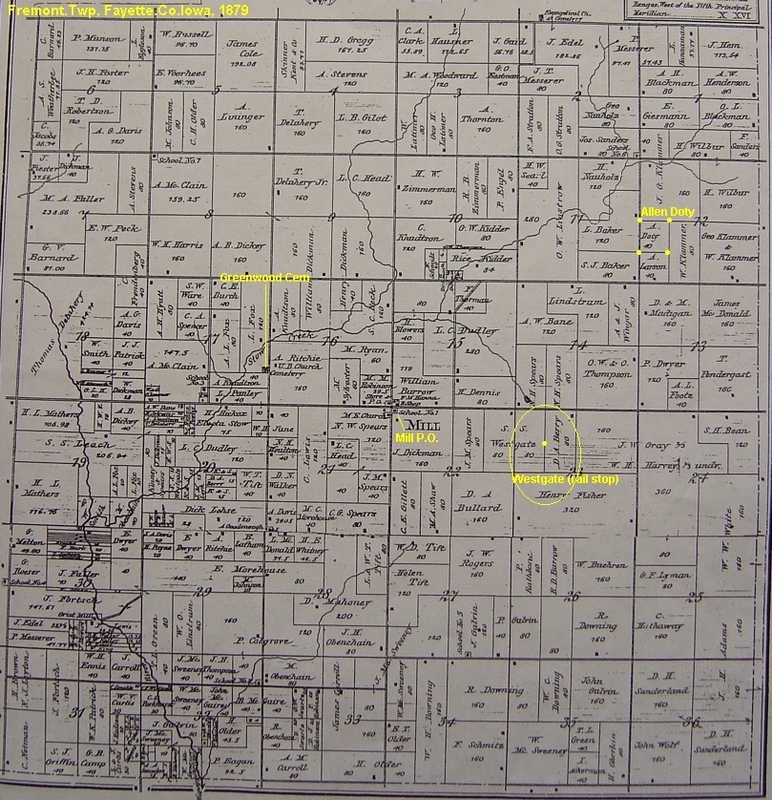 Note 14: 1870 Census; listed Geo Mckee (not Doty) with Geo McKee60, 1+mi NW of Albany, Westfield.Twp, Fay.Co.IA. Note 15: 1870 GeoMcKee60, John27, Jane23, Sarah20, James24, Gilford18, Geo (Doty) McKee11, Wm4. Note 17: 1880 Census; 20IL, farm hand with H.L. Hazel1842NY family, Bennington.Twp, Bk.Hawk.Co.IA. Note 19: 1885 Census; laborer, living with Daniel Hepshire1806PA, Jesup, Buchanan.Co.IA. 3 DOTY, Allen b: 18 Apr 1847 in Momence, Kankakee.Co.IL d: 11 Jul 1936 in Westgate, Fremont.Twp, Fay.Co.IA Burial: Greenwood Cem, lot 8, Westgate area, Fremont.Twp, Fay.Co.IA. Note 4: Birth location of parents not listed in any census, bz/2011. Note 5: Bet. 1855 - 1875 ?Where is Allen after death of father Sullivan in Fayette? Note 7: 1878 Hist; farming sec 21(no 21 land on 1879 plat, may be 12? ), Mill P.O., Fremont.Twp, Fay.Co.IA. 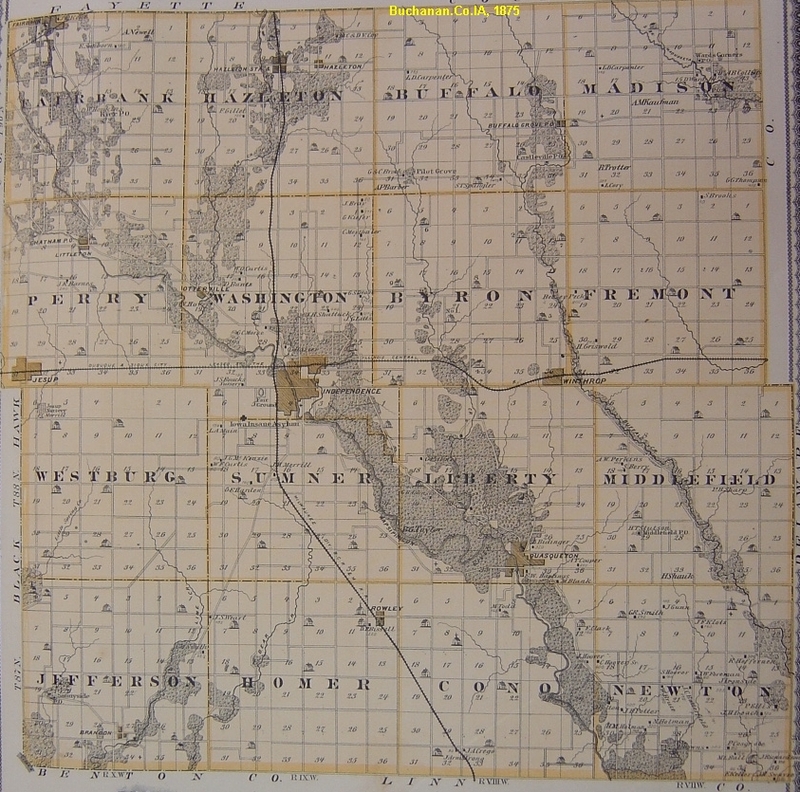 Note 8: 1879 Plat; 40a, NW1/4 of SW1/4, sec 12, Fremont.Twp, Fay.Co.IA (only land owned). Note 10: 1880 Census; farming Smithfield.Twp, Allen31, Alma25, AlbertJ4, m/law Mary Fuller50. 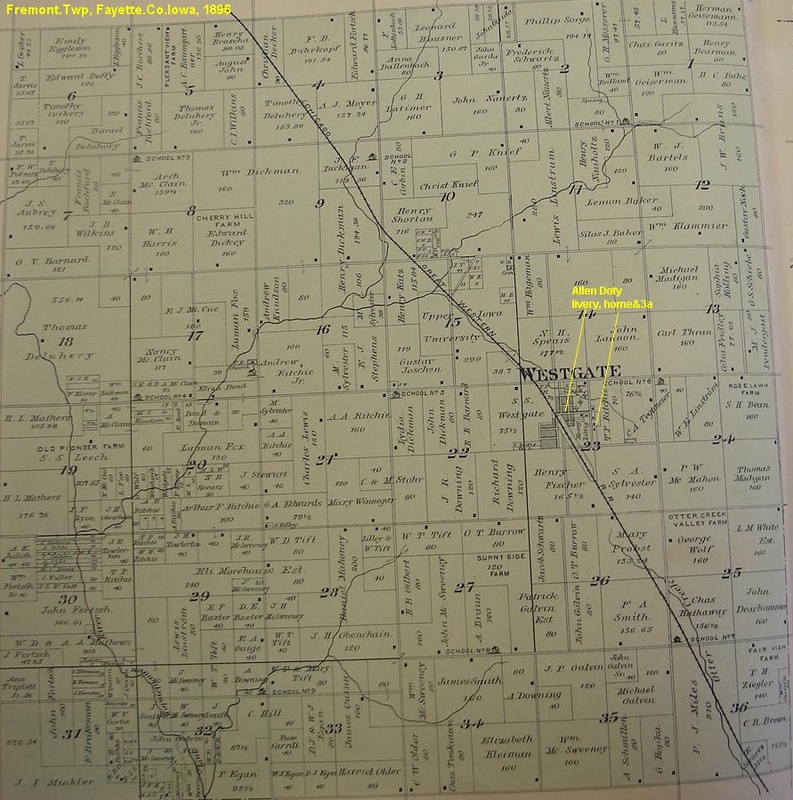 Note 11: 1885 Census; farming 4m S of Fayette, NW1/4 of NW1/4, sec 17, Smithfield.Twp, Fay.Co.IA. Note 12: 1885 Allen37, Alma30, Albert4, Hattie3, Lester0, m/law Mary Fuller76. Note 14: 13 Dec 1894 Oel.Paper; Allen Doty, Westgate Livery, Feed & Sale Stable. Note 15: 1895 Census; farming, Westgate area, Fremont.Twp, Fay.Co.IA. Note 16: 03 Jan 1895 Oel.Paper; Westgate liveryman, new express/baggage wagon, can carry 2000lb. Note 19: 1900 Census; Allin Daughtery Apr 1847, farming, Smithfield.Twp, Fay.Co.IA. Note 20: 1900 Allin1847, Alma1853, Albert1876 & wf Ellie1881, HattaF1881, LarryW1884. Note 21: 1905 Census; Westgate, Fremont.Twp, Fay.Co.IA, Allen, Alma, Roy. Note 22: 1910 Census; farming, with wf, Westgate village, Fremont.Twp, Fay.Co.IA. 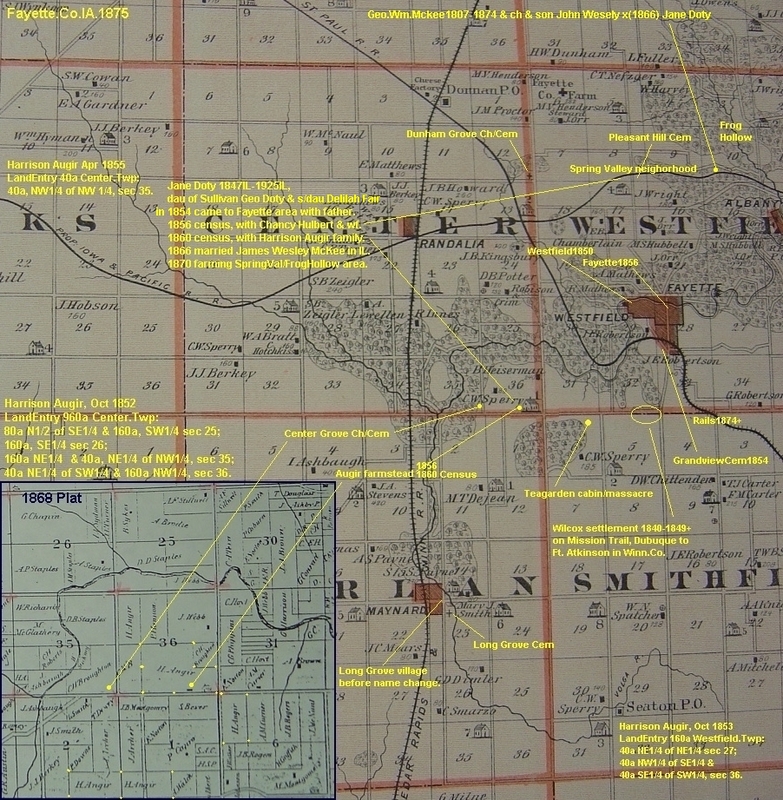 Note 24: 12 Dec 1910 Oel.Paper; Allen to Alma Doty, land in NW1/4 of SW1/4 of NE1/4, sec 23, Fremont.Twp, $1. Note 25: 1915 Census; Westgate, Fremont.Twp, Fay.Co.IA. Note 27: 1920 Census; wid, with son Wm in W 4th St, Oelwein, Fay.Co.IA. Note 28: 1930 Census; with son Albert, Oelwein.IA. ... 5 DOTY, Benjamin Benney Ben Everett b: 02 May 1903 in Oelwein, Fay.Co.IA d: 17 Jan 1967 in Fay.Co.IA? Burial: Woodlawn Cem, Oelwein, Fay.Co.IA. .... 6 DOTY, Wallace Keith Mike b: 13 Aug 1923 in Oelwein, Fay.Co.IA d: 30 Jan 1975 in IaCityHosp, res of Oelwein, Fay.Co.IA Burial: Woodlawn Cem, bk 16, lot 22, Oelwein, Fay.Co.IA. Note 8: Worked at John Deere in Waterloo.IA. .... 6 DOTY, Vivian Louise b: 04 May 1929 in Oelwein, Fay.Co.IA d: 24 Mar 1932 in Oelwein, Fay.Co.IA Burial: Woodlawn Cem, Oelwein, Fay.Co.IA. .... 6 DOTY, Marrian b: 17 Jan 1931 in Oelwein, Fay.Co.IA d: 17 Jan 1931 in Oelwein, Fay.Co.IA Burial: Woodlawn Cem, Oelwein, Fay.Co.IA. .... 6 DOTY, Darrel Duane b: 07 Nov 1934 in Oelwein, Fay.Co.IA d: Nov 1934 in Oelwein, Fay.Co.IA Burial: Woodlawn Cem, Oelwein, Fay.Co.IA. .... 6 DOTY, Dorothy Ellen b: Oct 1920 in Oelwein, Fay.Co.IA d: 24 Oct 1920 in Oelwein, Fay.Co.IA Burial: Woodlawn Cem, Oelwein, Fay.Co.IA.
. 4 DOTY, Hattie F. b: 20 Jul 1881 in Sec 17, Smithfield.Twp, Fay.Co.IA d: 21 Sep 1907 in Maynard area, Harlan.Twp, Fay.Co.IA Burial: Greenwood Cem, lot 8, Fremont.Twp, Fay.Co.IA. ... 5 DOTY, Noel Carrol b: 20 Mar 1930 in Oelwein, Jefferson.Twp, Fay.Co.IA d: 31 Mar 1930 in Oelwein, Fay.Co.IA Burial: Oran Townhip Cem, W of Oelwein, Fay.Co.IA. 3  DOTY, Jane A. b: 18 Apr 1847 in Momence.Twp, Kankakee.Co.IL d: 03 Jun 1925 in Dau Ellen Bard's hm, Watseka, Middleport.Twp, Iroquois.Co.IL Burial: Oak Hill GAR Cem, Watseka, Iroquois.Co.IL Note 3: Abt. 1855 IL to Westfield.Twp, Fay.Co.IA? (1856 census lists 1yr in IA, is valid bz/2011). Note 4: 1856 Census p1, Westfield.Twp, Fay.Co.IA: Chancy (Hulbert) Hubbert1832NY mason, wf Emalina1833IN, Jane Doty Hubbert 1847IL. Note 5: 1856 Resident of Iowa listed as 1y; adj to Loren Butler1821NY family in sec 9,Westfield.Twp. Note 6: Bet. 1856 - 1860 To live with Harrison Augir family, near Westfield P.O., Fay.Co.IA Note 8: 1860 Census; Jane Doty with Harrison Augor/Augir family, SE corner, Sec 36, Center.Twp, Fay.Co.IA. Note 9: 1860 Harrison Augir1817/NY, major farm land, 3+mi SW of Main.St, Fayette.IA. Note 10: 1860 Harrison1817NY, Clarissa1823NH, Casius1846WI, Ellise1853WI, Clarence1857IA; Jane Doty1847IL, Eliza Linn1837IN, WallaceE Linn1860IA. Note 11: Bef. 1866 Apparently returned to Kanakee.IL to marry, then came back to Fay.Co.IA with f/law 1866-1869. Note 14: 1870 Census; married to JohnW McKee, with wid f/law, center of sec 16, 1+mi NxNE of Fayette, Westfield.Twp, Fay.Co.IA. Note 19: Bet. 1897 - 1925 Living at 102 Mulberry.St, Watseka, Iroquois.Co.IL Note 20: 1900 Census; 53y, mother listed b. PA, farming, with husb JohnMcKee57y, son John14, Mulberry.St, Watseka, Middleport.Twp, Iroquois.Co.IL. Note 22: 1920 Census; 73IL, mother listed b. PA, with 2nd husb Thomas Diggle74 in Watseka, Iroquois.Co.IL. Note 23: 1924 Living in LaFayette.Co.IN for over a year, then returned to Watseka.IL. Note 24: Dec 1924 Health went downhill after contracting flu. Note 27: Cause of death; heart failure. Note 28: IL.Death.Cert; gives birth/death locations/dates, burial, lists father as George. .... +MCKEE, John Wesley b: 21 May 1843 in Chillicothe, Ross.Co.OH d: 14 Jul 1908 in Watseka, Middleport.Twp, Iroquois.Co.IL Burial: Oak Hill GAR Cem, Watseka, Iroquois.Co.IL m: 18 Jan 1866 in St. Anne, Kankakee.Co.IL Father: George William McKay MCKEE Mother: Ann Mariah CARTER Note 3: Abt. 1847 Moved with parents to St.Anne area, Iroquois.Co.IL. Note 5: 1850 Census; 5y, with parents, Campton, Kane.Co.IL Note 6: 1860 Census; 17y, with parents/siblings, farming, Ganeer (Momence P.O. ), Kankakee.Co.IL. Note 8: Bet. 1862 - 1865 Enlisted Co H, 76th IL Inf; in battle of Vicksburg, Ft.Blakely.AL. Note 9: Abt. 1869 Moved with father & 3 siblings, IL to 30a farm SW1/4, SE1/4, sec 10, Westfield.Twp, Fay.Co.IA. Note 10: 1870 Census; farming, with father, 30a, SW1/4 of SE1/4, sec 10, Westfield.Twp, Frog Hollow area, 1+mi NW Albany, Fay.Co.IA. Note 11: 1870 Geo1810PA wid, Sarah1850IL, James1846IL, Gilford1852IL; son John McKee1843OH & wf JaneDoty1847IL, their sonWm1866IL. Note 12: 1870 Neighbors; bro A.D. McKay, Samual Wroe, Hill, Thorp, Hutchinson; IL & UB Ch connection families. Note 13: 1879 Plat; land in Frog Hollow still listed for father & bro. David (as McKay); David may be farming it, bz/2012. Note 14: Abt. 1879 Moved from IA back to Iroquois.Co.IL Note 15: 1880 Census; farming, Martinton, Iroquois.Co.IL. Note 16: 1880 John1843OH, Jane(Doty)1847IL, WmH1867IL, Elen1874IL, CharlesA1878IA. Note 18: Abt. 1883 Suffered stroke, left side paralysis rest of life, age 40. Note 21: Abt. 1897 Moved to home in east part of Watseka.IL. Note 22: 1900 Census; 57y, farming, with wf Jane53, son John14, Mulberry.St, Watseka, Middleport.Twp, Iroquois.Co.IL. Note 27: Cause of death; final stroke, paralysis, 65y1m23d, Watseka.IL Note 28: Pics on Ancestry, search John Wesley Mckee, bz/2011. Note 29: Obit states birth; Apr 18, 1846, Momence area.
. 4 MCKEE, William Henry b: 27 Oct 1866 in Milford, Iroquois.Co.IL d: 20 Nov 1902 in Elma, Howard.Co.IA Note 8: 1870 Census; with g/f McKee & parents, sec 10, Frog Hollow area, 1+mi NW of Albany, Westfield.Twp, Fay.Co.IA.
. 4 MCKEE, Polly b: Abt. Jul 1868 in Milford, Iroquois.Co.IL or SW1/4, SE1/4, sec 10, Westfield.Twp, Frog Hollow 1+mi NW of Albany, Fay.Co.IA. d: Abt. 24 Oct 1869 in SW1/4, SE1/4, sec 10, Westfield.Twp, Frog Hollow 1+mi NW of Albany, Fay.Co.IA. Burial: 26 Oct 1869 Grandview Cem, sec A, lot 66, burial #136, unmarked, age 1y3m, Fayette, Fay.Co.IA. Note 6: Death? 1868, listed by Bulmer/Ancestry?, Grandview records contradict, bz/2012. Note 8: 1870 Census; g/f & father living sec 10, Frog Hollow area, 1+mi NE Albany, Westfield.Twp, Fay.Co.IA. 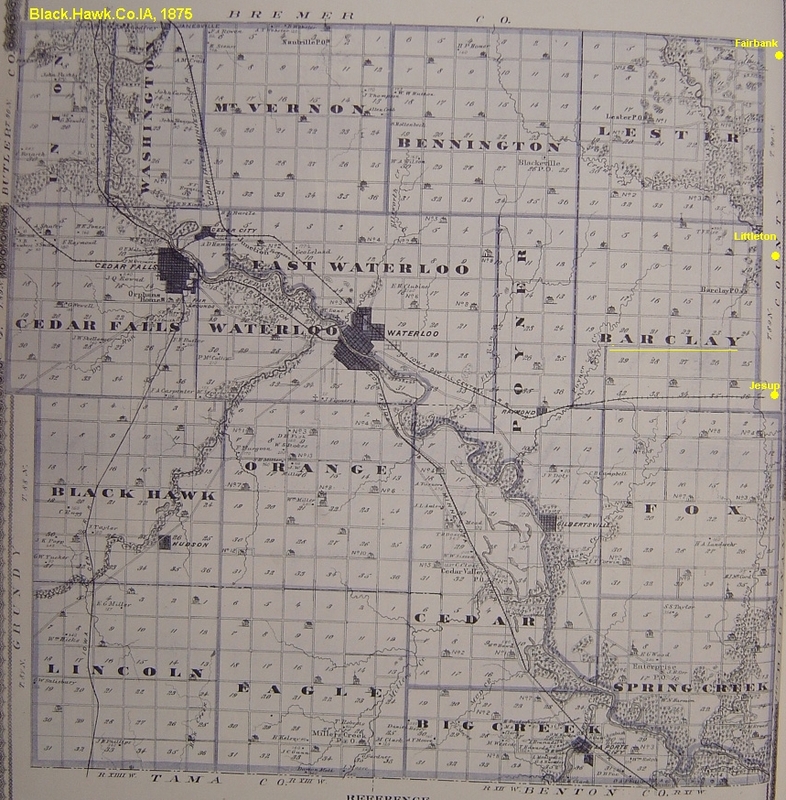 Note 9: See g/f & father's time line notes, bz/2012.
. 4 MCKEE, Cora b: 07 Jul 1870 in SW1/4, SE1/4, sec 10, Westfield.Twp, Frog Hollow 1+mi NW of Albany, Fay.Co.IA. d: Abt. 17 Aug 1872 in SW1/4, SE1/4, sec 10, Westfield.Twp, Frog Hollow 1+mi NW of Albany, Fay.Co.IA. Burial: 19 Aug 1872 Grandview Cem, lot 66, N 1/2, unmarked, burial #189, 2y, Fayette, Fay.Co.IA. Note 6: 1870 Census; father living sec 10, Frog Hollow area, 1+mi NE Albany, Westfield.Twp, Fay.Co.IA. Note 7: See father's time line notes, bz/2012.
. 4  MCKEE, Ellen Melvina b: 14 Jan 1874 in Fayette, Buchanan or Howard Co, IA d: 16 Sep 1961 in Evansville, Vanderburgh.Co.IN Burial: GAR Cem, Watseka, Iroquois.Co.IL Note 8: Birth? listed Independence, Buchanan.Co.IA by Bulmer/Ancestry?, bz/2012. Note 9: 1874 G/f Geo. Mckee still alive on sec 10 farm, Westfield.Twp, Fay.Co.IA. Note 10: Did parents leave Fay.Co.IA farm after marriage, going to Independence? bz/2012. Note 22: 1909 Living in Watseka.IL. ..... +BARD, Joseph Morris b: 26 Dec 1859 in St. Mary, Elk.Co.PA d: 24 Apr 1925 in Watseka, Iroquois.Co.IL m: 28 Sep 1892 in Kankakee.Co.IL Father: John W. BARD Mother: Barbara Johannan AUMAN Note 8: 1900 Census; faming/renting, Howard.Co.IA.
. 4 MCKEE, John Alvin b: 23 Apr 1886 in Martinton.Twp, Iroquois.Co.IL d: 02 Feb 1981 in Valparaiso, Porter.Co.IN Note 9: 1908 Living in Watseka.IL. ... +FAIR, Delilah Deliah Fears b: Bet. 1813 - 1814 in Casey.Co.KY d: Aft. 1885 in Jesup, Buchanan.Co.IA or Bk.Hawk.Co.IA m: Bet. 1853 - 1854 in IL or IN Father: Aaron B. Absalom Absolam Fare Far Fears FAIR Mother: Leah SMITH Note 4: Given analogs; Delilah, Deley, Delia. Note 6: Bef. 1838 Married Unknown Clouse in IN or KY, two known ch. MarthaA1838IN, Wm1848IN. Note 7: Bet. 1848 - 1849 Clouse husband dies; in Aug 1849, she remarries widower David T. Williams in IN. Note 8: Bet. Dec 1849 - Feb 1850 David dies in a winter snow storm, leaving Delilah pregant, with her 2ch & his Miranda1838. Note 9: Sep 1850 Census; Beaver.Twp, Jasper.Co.IN, Delilia (nee Fair, Clouse) Williams, 37/KY, baby Samuel David T. Williams 0/IN. Note 10: Sep 1850 Delilia also has her 2 ch MarthaA Clouse12/IN, Wm Clouse2/IN, s/dau Miranda Jane Williams12/IN. Note 11: Bet. 1851 - 1852 Delilah may have remarried an Unknown Merritt, birthing son Samuel W. Merritt1852/IL. Note 12: Bet. 1853 - 1854 Delilah married widower Geo. Sullivan Doty, moving to Westfield area, Fay.Co.IA. 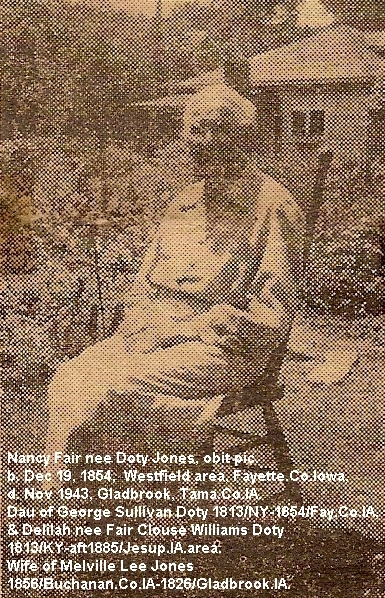 Note 13: Dec 1854 Sullivan Doty died, Delilah gave birth to their dau Nancy Fair Doty, likely in Westfield, Fay.Co.IA. Note 14: Bet. 1855 - 1860 ?Where is Delilah? She will remarry Daniel Hepshire by 1860. Note 15: 1860 Census; farming, N of Chatham (Littleton) P.O., Alton (Fairbank).Twp, Buchanan.Co.IA. Note 16: 1860 Daniel Hepshear40PA, ch with 1st wf, Henry Hepshear16IL, Wm Hepshear13IN Note 17: 1860 Delilah46KY, son Samual David T. (Williams)10IN Hepshear; dau Nancy (Doty)5IA Hepshear. Note 19: 1870 Census; farming, Barclay.Twp, Bk.Hawk.Co.IA (just west of Fay.Co.IA). Note 20: 1870 Daniel Heptsher59, Delilah57, her son Samuel Williams19IN. Note 22: 1880 Census; farming, Monroe.Twp (NE corner), Fremont.Co, SW corner of IA. Note 23: 1880 Daniel Hepshery69PA, Delia66KY, her son Samuel d. Williams29/IN. Note 24: 1880 Farming close is dau Nancy Fair nee Doty Jones, husb Melville & son Lawrence. Note 26: 1885 Census; S. Ainsworth St, Jesup, Perry.Twp, Buchanan.Co.IA. Note 27: 1885 Daniel Hepshire79PA blind, Delila71KY, her son Sam Williams 36IN laborer, Geo. A. Doty 26IL laborer. 3 DOTY, Nancy Fair b: 19 Dec 1854 in Littleton.area, Buchanan.Co.IA or Westfield village, Fay.Co.IA d: 1943 in Gladbrook, Tama.Co.IA Burial: Badger Hill Cem, Gladbrook, Tama.Co.IA. Note 11: 1900 Census; b.Dec1850/IA, husb & 6ch, Oelwein, Fay.Co.IA. Note 12: 1900 Melville44, Nancy44, LawrenceI24, Jesse18, Grace14, Mildred12, Ralph9, Orpha4. Note 14: 1910 Census; 55/IA, husb Melville & 6ch/6living, parents b. KY, 4th St, Wadena, Wadena.Co.MN. Note 15: 1910 Living with is, Samuel W. Merrett 58/IL, parents b. KY, (listed b/law of husb, thus bro of Nancy). Note 20: 1920 Census; 55/IA (age?? ), father b. OH (?? ), mother KY, Gladbrook, Tama.Co.IA. Note 21: 1920 MelvilleS 54IA, NancyF55IA, RalphE28IA. Note 23: 1925 MelvilleL67, NancyF70IA, RalphE33, ElmerN7, RoseE8. Note 24: 1925 Census; 70/IA, with husb, adopted son Ralph & his two ch, 3rd St, Gladbrook, Tama.Co.IA. Note 25: 1925 Father listed Selvanus Doty b.?, mother Deliliah Clauss b.KY, married IL. Note 27: 1930 Census; wid, adopted son Ralph with, Gladbrook, Tama.Co.IA. .... +JONES, Melville Melvin Lee b: May 1856 in Fairbank area, Alton(Fairbank) Twp, Buchanan.Co.IA d: 1926 in Gladbrook, Tama.Co.IA Burial: Badger Hill Cem, Gladbrook, Tama.Co.IA. m: 02 Jul 1875 in Prairie du Chien, Crawford.Co.WI Father: Alva W. JONES Mother: Sarah Jane LEE Note 6: 1860 Census; with parents, farming near Fairbank, Fairbank.Twp, Buchanan.Co.IA. Note 7: 1860 Alvy49, SarahJ46, Theodore16, Melville13, MaryE8. Note 8: 1870 Census; with parents, farming near Fairbank, Fairbank.Twp, Buchanan.Co.IA. Note 9: 1875 Marries Nancy Fair Doty. Note 10: 1880 Census; farming Riverside.Twp, Fremont.Co.IA (far SW corner), wf Nancy & son Lawrence, parents near. Note 11: 1895 Census; Bk.Hawk.Co.IA Note 12: 1900 Census; RR boiler maker, wf & ch, Oelwein, Fay.Co.IA Note 13: 1900 Melville44, Nancy44, LawrenceI24, Jesse18, Grace14, Mildred12, Ralph9, Orpha4. Note 14: 1910 Census; laborer, odd jobs, wf & ch, 4th St, Wadena, Wadena.Co.MN Note 15: 1910 MelvilleL52IA, Nancy55IA, Irwin34, Mildred22, Ralph19, Orpha14, SamuelWMureet38, Bell Luttrull14. Note 16: 1910 Samuel W Murett/Merritt with, 38IL, listed b/law, parents b. KY. Note 22: 1920 Census; city utility laborer, wf & step/son, 3rd St, Gladbrook, Spring.Creek.Twp, Tama.Co.IA. Note 23: 1920 MelvilleL54, NancyF55, RalphE28IA laborer. Note 24: 1925 Census; Gladbrook, Tama.Co.IA, Melville67, NancyF70, adopted son RalphE33 div. with ch. ElmerN7, RoseE8. Doty George Sullivan Doty Unknown 1st wf, abt1815/NY-abt1851/Kankakee.Co.IL? ; 2nd wf, Delilah nee Fair Clouse Williams abt1813/KY-aft1885/Buchanan.Co.IA ? abt 1813 abt Jun 1854 Grandview Fayette Sec A, lot 66, S 1/2, unmarked burial #3 (listed as Doty, Mr. David). Son Allen's obit; Sullivan came to Fayette (Westfield village) area shortly after Allen's mother died at age 3. Ch with unknown &/or adopted: David, Unknown dau?, George, Lewis, David, Allen, Jane A. & possibly James, Sarah, SilasA or other unknowns. Ch with Delilah Fair; Nancy Fair (Melville Jones). Doty David (Geo Sullivan?) Doty Doty, suspect this is Geo. Sullivan, bz/2012 1854 Grandview Fayette Sec A, lot 66, S 1/2, unmarked burial #3 (listed as Doty, David Mr). Lot 66 owners are Doty/McKee, thus related to the Mckee line, bz/2012. Limited data & insight seem to point to #3 burial being Geo. Sullivan Doty, bz/2012/Jan20. Doty Allen Doty Fuller Alma 1853NY-1915/Westgate.IA Apr 18, 1847 Jul 11, 1936 Greenwood Fremont Twp Lot 8. Son of George Sullivan Doty abt1813/NY-1854/Fayette.IA. & 1st Unknown Wf abt1815/NY-abt1851/IL. Ch; Albert J, Hattie F, Wm Leroy, Lester. Doty Alma Fuller Doty Allen 1847/IL-1936/Westgate.IA 7 May 1853 8 Dec 1915 Greenwood Fremont Twp Lot 8. Dau of Unknown Fuller ?/?-?/? Mary Unknown 1815/NY-1874/Fremont.Twp. Ch; Albert J, Hattie F, Wm Leroy, Lester.